Easy Ad Posting Jobs Premium Membership registration fees and earning. Reason for collecting the Registration/Subscription fee? 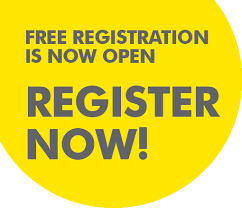 The reason for collecting the Registration fees is for Consultancy Charge + Online Training + Account activation + Account maintenance + Online Support a complete support like phone support, chat support, email support and also for cross checking the reports submitted by the members every month and collection expenses to collect payment from client by our executives. Membership fee is non refundable and we are not responsible if you don’t take our support or if you don’t work. Company Policy – We believe people are our strength and they are fundamental to our. Registration Registration is open to all with computer literacy and one can register themselves as and when possible. By calling / mailing / Visiting us. There are various grades of Registration. Only one registration is permitted per individual. The details of the schemes will be available at our office during registration or on line on inquiry. 100% Job Guarantee!! Start Your Job within 24 Hours. Now you get per ad posting, per ad hits/response & referral income. Ad Response & Referral Incentive:- Now you get per affiliate register with email verification Rs.3/- & Rs.300/- on every direct Joining/Selling Package of Ad Posting Job Package A, Package B, & Package C. only. Always use your affiliate link provided by our company and share it to Friends. The affiliate links free on every joining. For every candidates work and processing their jobs we need to invest a lot of human and other resources. If someone registers with us and doesn’t work properly, at least up to a minimum volume, not only s/he losses the opportunity but our resources are wasted and we incur loss. So, as per our rules candidates must ensure they work and generate at least Rs. 500/- approved earning for them in every single month. Induction of Fresh members – Register members are liable to get a commission for introducing fresh / new members for the company @ Rs. 170.00 Rs. 200.00 and Rs. 250.00 respectively for introduction. The payments can be done in Cash / Money Order / Draft. These are the accepted mode of payments of our company. Registration is valid for a period of Six Months only. 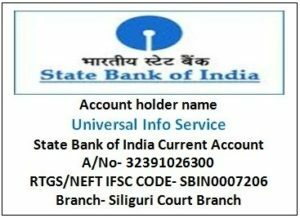 For payments drafts to be drawn in favor of ‘Sawmitra Sarkar’ or Universal Info Service™ payable at Siliguri or Coochbehar, West Bengal, India. IMPORTANT:- We are always suggest you that read the details terms & conditions/demo work before joining. You can contact us on helpline number at +91-9434019000 for work details.